Witnessing the recent drama of the refugee children has been painful because we are wired for empathy. Even three-month-old infants show a marked preference to play with those who display altruistic behavior over “me first” actors. Both our ability to empathize and our desire to help is partially caused by mirror neurons, a type of cell in our brain that fires in imitation to what is seen, so that we seemingly experience it too. Regardless of our political ideals, we feel real pain when we hear about “babies in cages” and our instinct to “tend and befriend” is triggered. One of the chemicals involved in this instinct is also responsible for the bond between parents and children, the bond between lovers, and the bond between best friends. Oxytocin, commonly known as “the love drug,” is a powerful hormone that plays a role in forming social memories, trust and reducing anxiety. A long, heartfelt hug or a deep belly laugh can release this hormone. Suboptimal levels of oxytocin have been shown to lower the ability to empathize with others. Separated from their parents, the detained children have no one to provide a sense of affectionate welcome or reliable support. In their book “The Circle of Security,” award-winning therapists Powell, Cooper, Hoffman and Marvin teach the importance of caregivers creating a secure attachment and using that bond to help children cope. The overstressed and underpaid workers in detainment camps are untrained in supporting young children’s emotional needs during times of toxic stress. There simply are not enough people to soothe all the children and be consistently supportive. The longer the children remain separated from their parents, the longer their minds and bodies are exposed to the “fight or flight” state of being — a stew of chemical responses that over time reshape their brains, impair their physical health, and impact their ability to regulate emotions. And now we see this on our TV screens every night and that will hurt us, too. Because our brains are not very good at distinguishing between a trauma experienced and a trauma viewed, our mirror neurons are firing again. This is one of the reasons therapists find that children who witness violence are sometimes just as difficult to treat than those who experience it. Treatment is especially challenging when very young children have no words to organize and categorize their trauma. Their brains store their pre-verbal memories in seemingly arbitrary corners of their psyche, surprising themselves with unexpected and unpleasant sensations, feelings, and behaviors at ostensibly random times. 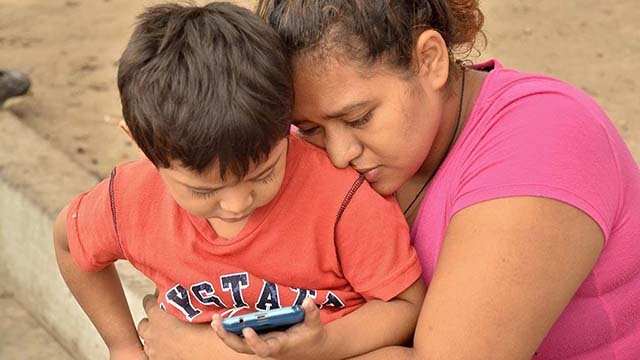 Here at Para Las Familias, a program of Episcopal Community Services, we provide attachment-based family therapy to children up to age five, using the “Circle of Security” model. We see children who have experienced all kinds of trauma, including the trauma of a broken attachment bond to a parent. Our attachment-based therapists use the “tend and befriend” response to rescue families from the negative consequences of traumatic stress. We “tend and befriend” our clients in sessions and communicate safety and compassion with our mirror neurons. We assess how a child and parent work together to soothe emotional pain. Play-based interventions promoting physical contact, warm gazes, delight, and just the right amount of support during difficult tasks, increase oxytocin. It’s impossible to describe the physical change seen in a parent-child pair when they are attuned to each other, wrapped up in our therapeutic blankets and singing lullabies together. The very air in the room transforms. Descartes famously said, “I think therefore I am.” But neuroscience has discovered that first, babies feel. Their experience associated with those feelings is what leads to the first steps towards consciousness of the self as an individual. We feel, then we think, and therefore we are. Feelings must be seen, named, validated and regulated for young children so they learn to interpret their own emotions and soothe themselves as they get older. By stripping young children of their attachment figures, we are interrupting that development of self-regulation. Their stress will be what their neurons communicate to the child minders and the guards at the camps who then will mirror that to their own loved ones, and like a disease, trauma will have impacted an entire generation. However, like laughter, love is also contagious. Because of this, we urge the powers that be to choose empathy. Andrea P. Gonzalez, a licensed clinical social worker, is the program manager for Para Las Familias at Episcopal Community Services.